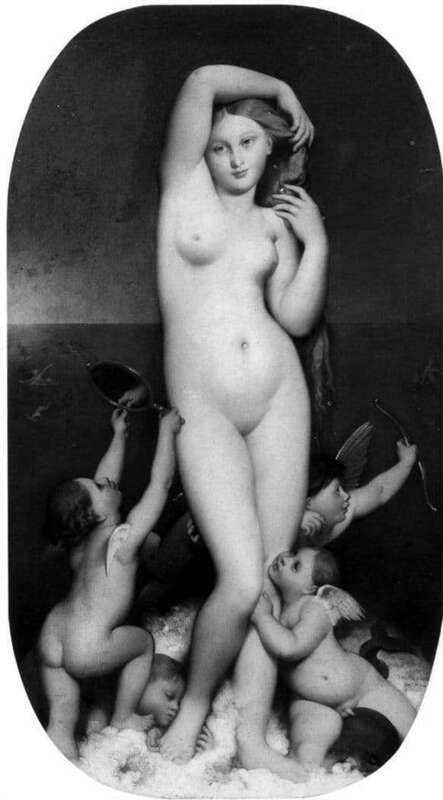 The painting “Venus of Anadimeon” was painted by the famous French artist Jean-Auguste Ingrom in 1848. Writing a canvas, just 1.63 meters high and 92 centimeters wide, took nearly 40 years. In 1808, the artist began working on a painting, wrote half of it, and for four decades he did not dare to take up the brush, because he did not find inspiration in himself to continue. The completed picture was not liked by everyone, because the author made some inaccuracies in drawing the knee of a beautiful goddess. And yet, despite this, the painting was purchased from the artist and exhibited at the World Exhibition in 1855. The plot for writing the canvas was the story of the struggle of Kronos and Uranus, which caused the birth of the delightful Venus, or Aphrodite. Kronos seriously quarreled with Uranus, which led to his castration. The divine seed mixed with blood and fell into the waters of the sea. As soon as this happened, a beautiful moon-faced goddess rose from the foam of the sea. It was named Venus of Anadimeon – Venus born out. In the center of the canvas is Venus herself, depicted as a naked young girl with long blonde hair and a magnificent bust. one hand is thrown over her head, and the other gently runs through her hair. Around the heavenly beauty gathered children Cupids. Some of them hold small bows in small cams, others offer the goddess to look in a golden mirror so that she can see for herself her own beauty. Cupids are extremely delighted with what is happening, two of them crouched at the feet of the goddess and embrace them as if she is the best creature they have ever seen. At the feet of the goddess to foam the sea, the cupids are buried in this foam, but do not give up. In the background of the picture – a calm night sea. In the distance, several human silhouettes can be seen on the dark surface of the water.